If you're trying to decide between "101 Funny Employee Awards" and "101 Funny Office Awards", you're in the right place. This is comedian Larry Weaver and I created them both. 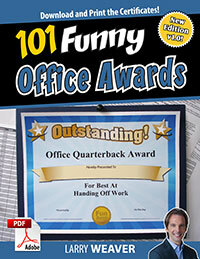 The short answer is this: if you work in an office, get "101 Funny Office Awards". Otherwise, get "101 Funny Employee Awards." The first collection of funny awards I released was way back in 2007. The title back then was "Funny Employee Awards: Your Complete Guide to Organizing a Humorous, Entertaining, and Rewarding Recognition Ceremony." This original collection had a decidedly office-oriented slant. It's safe to say that all of the awards were inspired from my days toiling away in an office environment. Then I took the show on the road. Shortly after releasing the first collection of awards, I created a live comedy show based on the book. I would (and still do) travel around the country hosting a funny award show for companies and organizations. A lot of the organizations were decidedly blue-collar. I'm talking warehouses, distribution centers, firefighters, EMS workers, food service, catering, truckers, hairdressers... the list goes on. For most of these organizations, the majority of employees simply didn't work in an office. Based on demand, I released a collection of "Funny Teacher Awards." But I knew I had to do more. A few years back I created a more generic collection called "Funny Awards Certificates". These were meant to be a catch-all collection for friends, family, teammates and coworkers. That still didn't quite solve the problem, so I bundled that collection with the employee awards to create a "Funny Office Awards" bundle. But all of that was just a delay to the inevitable. I had to break out office awards from employee awards. Finally, in the Summer of 2013, I sent my calls to voicemail, shut down Outlook and started writing new awards. I didn't know at the time that I would end up rewriting ALL of my collections - ending up with four collections of 101 awards (that's 404 funny awards for you non-math majors). 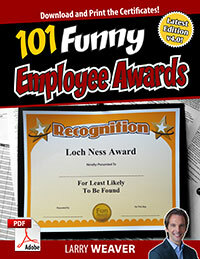 Today, the newest collection of "101 Funny Office Awards" are for office workers and the totally revamped collection of "101 Funny Employee Awards" have a more generic slant that can apply to any workers in any job. If you can get them both, do that. A lot of hard work went into them and you won't be disappointed!